Dr. Matthew James is a native of New Braunfels, TX where he graduated from Canyon High School in 2008. He then attended UTSA on a baseball scholarship and received his Bachelor’s degree in Kinesiology in 2012. Mel Mitchell office manager of SA Elite Chiropractic with Dr. Matthew James DC. I strive to run the practice with efficiency and for it to be a pleasant experience for all involved. Native of SA with 28 years in the medical field which has always been my passion. I strongly value the relationship between our patients, the staff and myself. My name is Belinda and I have been a Licensed Massage Therapist since June 2006. I specialize in Upper Extremities and I'm certified for Pre-natal therapies. Roxie Soto has 7 years of experience in massage therapy. She specializes in deep tissue and trigger point therapy. She has an extensive knowledge of pain points throughout the body and uses this to affect a high rate of patient satisfaction, especially with those who prefer deep tissue and a slow and steady pace. She attended South Texas Vo-Tech for her LMT training and graduated in 2012. Lisa Lopez was born and raised in Del Rio, Texas. She moved to San Antonio in 2016 to begin her studies as a Limited Medical Radiologic Technologist. 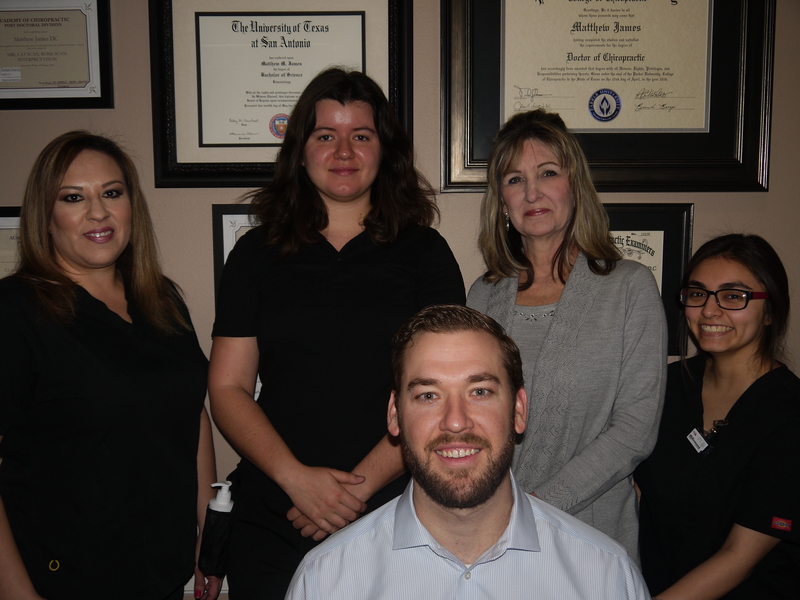 During her school hours she had the opportunity to intern for Dr. James at SA Elite Chiropractic which then led her to work for him. She looks forward to seeing you and giving you a smooth experience while taking your x-rays and helping in any way she can. Emily Veale was born and raised in San Antonio, Texas. My name is Jessica, I was born in Corpus Christi and spent my childhood growing up in a military family, traveling around the world.